With over 80% of Americans suffering from spine related pain according to research from the UNC School of Medicine and 68% of Americans struggling to fall or stay asleep according to a survey from Consumer Reports, the science of how to get a refreshing and comfortable night’s sleep is more relevant than ever. The scientific principle that lies at the center of both quality sleep and minimizing pain is a concept known as Spinal Alignment. Sleep researchers have found that spinal alignment is one of the key factors in sparking restorative REM sleep. One study found that people sleeping on a bed which kept their spine properly aligned throughout the night, particularly side and stomach sleepers, spent 49% more time in REM vs. those with a misaligned or curved spines. Spinal alignment means preserving your backs natural “S-Shaped” curvature that it holds when you stand with good posture while you are lying horizontally when sleeping. A mattress that isn’t supportive enough will sag in, overly curving your back, while a mattress that is too supportive won’t have the sink to allow your back to curve. Similarly, your neck has a gentle nature curvature that should be preserved for optimal sleep quality. Stacking too many pillows or sleeping on a pillow that is lofted too high can overly curve your cervical spine (AKA your neck) resulting in neck pain and strains, snoring, and other sleep related issues. An ideal pillow set up allows your head to rest in a neutral position, neither substantially elevated nor dipping down. Keeping your head and spine in a neutral position will vary quite a bit depending on your sleeping position. SIDE SLEEPERS: Sleeping on your side creates a substantial gap to fill between the shoulders and neck, and it’s important for this space to be filled appropriately to avoid neck stress. Similarly a side sleeper’s head will push much further down into the pillow but should also be equally supported. As a result, a side sleeper needs a pillow with the most loft or height of the three sleeping positions (especially someone with broad shoulders), but with flexibility to allow the head to settle at a lower height. Many side sleepers find a contouring foam pillow to be comfortable, or a pillow soft enough to allow the head to settle. Side sleepers can also benefit from a pillow between their knees while they sleep to align their pelvis and lower back while they sleep. BACK SLEEPERS: Back sleepers will only need a pillow high enough to fill the gap of the curvature of their neck. This requires a moderately filled pillow. A pillow that is too low will cause the head to lean backwards, straining the vertebrae. A common mistake for back sleepers is to sleep on a pillow that is too high or to sleep on multiple pillows which may initially feel comfortable but will cause stress from leaning forward over time. STOMACH SLEEPERS: Stomach sleeping is the least ergonomic position, as it tends to cause the back and neck to curve inwards. Sleeping on the stomach requires very minimal pillow height, and sleeping on a pillow with too much loft can cause serious neck and back issues. Stomach sleepers should also consider sleeping with a pillow under the hips to avoid lower back pain. Down are the softest feathers from a bird that sit underneath the feathers you see on the outside of their coat, commonly from waterfowl like geese. 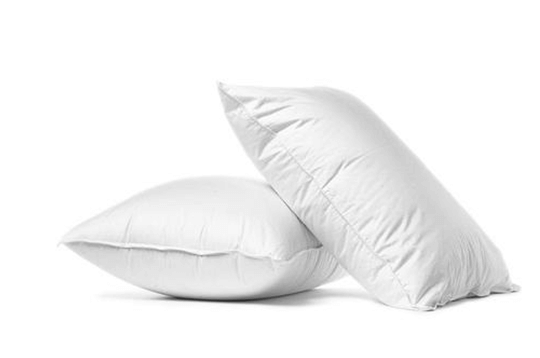 These pillows tend to be light weight and insulating, meaning they trap heat. However, down is not very supportive, meaning it can settle over the course of the night, requiring it to be refluffed. It can also be blended with feathers to provide more support. Synthetic down mimics the properties of down with synthetic materials such as polyester. It can provide more support than true down and can also be more durable. It is also hypoallergenic and more cost effective than down, but does not have the insulating properties of down. Solid foam pillows are typically made from polyurethane, memory or viscoelastic, or latex foam. These pillows are made from a single block of foam that can be cut into any shape, including a traditional pillow “cushion’ shape, or a contoured surface that can support differing heights for the head and neck. As a result, this pillow type offers a strong option for sleepers with neck pain or issues looking for a contoured option. The contouring properties of memory foam can be helpful to cradle the head and shoulders, while latex offers a highly breathable, more bouncy alternative. The primary issues tend to be with heat retention and some off gassing / odor issues for memory foam as the material is not very breathable, while latex allergy sufferers should skip any latex pillow; even if covered with a pillow case there is still some risk of exposure. Buckwheat pillows are actually filled with the hulls of buckwheat seeds, creating a natural and unique feeling sleep product. Buckwheat offers a great situation for sleepers who are looking for a harder sleeper surface, who prefer a natural filling, and who are looking for high air flow in their product, as the hulls allow air to flow freely through the pillow. On the downside, buckwheat pillows can be very heavy and can cause noise when tossing and turning as the hulls shake against each other. Cotton is an all natural material that is commonly used in all sorts of textiles, including bedding and apparel. It is naturally breathable and moisture wicking. A challenge with cotton is that it can retain moisture rather than allowing it to evaporate, so it can present challenges for hot and sweaty sleepers. Tencel is a high tech fiber that is produced from natural materials including Eucalyptus wood pulp and converted into a textile using processes leveraging nanotechnology. Tencel offers some key advantages over cotton. It is breathable, strong, and resistant to shrinkage and wrinkling. It is also made up of very small “hydrophilic” fibers, meaning it is both more breathable and moisture wicking, as well as softer than other fabrics. It is also naturally bacteria and odor resistant, which means it needs to be washed less frequently. Although it is made from natural materials Tencel is technically a synthetic fiber, and is can also be more expensive than more traditional materials like cotton. Phase Change materials were originally developed by NASA, to absorb and release heat for space suits. The technology works be embedding beads or a coating on the pillow fabric. When this material is exposed to body heat, it changes phase from a solid to a liquid (think of it like a wax melting, but less messy), and this change pulls away body heat, making the material feel cool to the touch. Phase Change materials offer a great option for hot sleepers, but it should be noted that they are not actively cooled like a refrigerator, meaning they won’t stay cool forever. Polyethelene is a food grade plastic textile that dissipates heat in two different ways. First by allowing heat and sweat to evaporate through the fabric, and second by allowing body heat that is emitted as infrared radiation to pass through fibers.Typically this type of heat accounts for 40-60% of our body heat and most textiles don’t allow this type of body heat to pass through. Researchers have found that polyethelene clothing can make wearers feel up to 4 degreers cooler. Polyethelene covered pillows are an innovative option for hot sleepers looking to stay cool at night. Pillows vary in size, and there’s no ideal pillow size for anyone - it’s purely based on a matter of personal preference and the size of a sleeper’s bed and mattress. Here are some of the most common pillow sizes. A Standard pillow is 20 inches tall and 26 inches wide (20” x 26”). A standard pillow is 20 inches tall and 28 inches wide (20” x 28”). A standard pillow is 20 inches tall and 30 inches wide (20” x 30”). A standard pillow is 20 inches tall and 26 inches wide (20” x 36”). Sleeping on the wrong pillow can cause a variety of sleep related issues. Here are a number of issues that can stem from pillow mismatches and potential solutions. Snoring can be stem from a variety of causes, including sinus infection, deviated septum, and being overweight, but any of these can be exacerbated by sleeping on the wrong pillow. Typically snoring is most associated with back sleepers, because this position causes the muscles in the throat and tongue, which relax while sleeping, to slump backwards into the airways. Tilting the head forward too much can exacerbate this issue. Finding the right pillow to alleviate snoring can come in two forms. First, a pillow that encourages side sleeping will help prevent the snoring issue associated with back sleeping. If that isn’t an option and back sleeping is a necessity, a pillow that is less high will prevent the head from tilting forward too much while back sleeping which should alleviate some of the worst back pain snoring related issues. Neck pain from sleeping is mostly associated with a pillow that causes your spine to be misaligned and stressed from its natural resting position. The key here is matching sleeping position and body type to the right pillow. See the sleeping positions section of this guide above for more detail, but in general, those with broad shoulders and sleep on their side should look for a higher pillow, back sleepers and stomach sleepers should look for a lower pillow. In addition, stomach sleepers with neck pain should consider trying another position, as stomach sleeping requires twisting the neck which can make existing neck pain and stress worse. Temperature issues are one of the top complaints for people who have trouble falling or staying asleep. Hot or sweaty sleeping is always uncomfortable and can stem from a sleeper’s pillow. 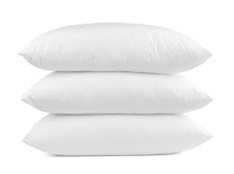 A key thing factor for a hot sleeper is choosing a pillow stuffed with a breathable material, such as synthetic down, shredded foam or buckwheat. The material should allow air to flow freely through it, so non breathable materials like solid memory foam, or filling with no breathable channels like solid blocks of foam should be avoided. Shredded memory foam is typically fine for hot sleepers, as it allows air to flow through the chunks. Another factor to look for is a breathable and/or cooling fabric covering the pillow. Materials like cotton will be breathable and moisture wicking, while fabrics including technologies like Tencel, Phase Change Materials, or Polyethelene will incorporate further cooling features which will help keep sleepers cool and sweat-less at night.